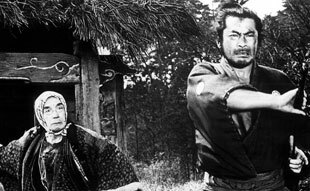 Mellow Monk's Green Tea Blog: The Kurosawa/Mifune classic "Yojimbo"
Princeton professor Michael Wood writes an excellent review of the film Yojimbo, directed by Akira Kurosawa and starring Toshiro Mifune, two powerhouses in the pantheon of Japanese cinema. The great Toshiro Mifune as the lone swordsman Sanjuro in the Kurosawa classic Yojimbo. Matsuzaka's gyroball: myth or reality? Chinese descendents of long-lost Romans? Japanese husbands celebrate "Beloved Wives Day"
Is it green tea's time?